The Holy Eucharist is celebrated each Sunday at 8:00 and 10:30 a.m. Both services follow Rite II from the Book of Common Prayer. The 8:00 Eucharist is celebrated without music. The 10:30 service includes organ music, a full choir, congregational singing and occasionally children’s singing or guest instrumentalists. The Sacrament of Healing is offered at both services. Wednesday Holy Eucharist & Healing is offered at 10:00 a.m. throughout the year. This is a small, very informal service that takes place in the Chapel and offers healing prayers, a shared homily, and Eucharist. The Saint of the Day is celebrated each week. The service is extremely friendly and welcoming – please join us. A Taizé Service is held on the second Sunday of each month at 6:00 p.m. The worship, modeled after the Taizé community in France, is quiet and reflective with brief readings and simple chants which are easy to sing. There is silence after each reading or chant, allowing the worshiper time for his or her own silent prayers and meditation. The church is lighted by candlelight, and icons help to draw worshipers into adoration. During the service, worshipers are invited to light a candle for any person or situation needing prayer; in this way they are surrounded by the Light of Christ. The service includes Holy Eucharist and healing. Centering Prayer begins at 12:00 noon on Tuesdays in the library. Centering Prayer is a modernized prayer method based on the intuitive prayer rooted in Lectio Divina. It is a method of silent prayer that prepares us to receive the gift of contemplative prayer, prayer in which we experience the Divine’s immanent presence with us. Centering prayer is grounded in relationship with God, through Christ, and is a practice to nurture that relationship. Other Worship Opportunities are offered throughout the year - check the newsletter or calendar for more information. Chalice Bearer–Assists the priest during communion by administering the chalice (cup of wine). Chalice Bearers are licensed by the Bishop at the request of the Rector. Lector/Intercessor– Reads the Old or New Testament Lessons or leads the Prayers of the People during worship. 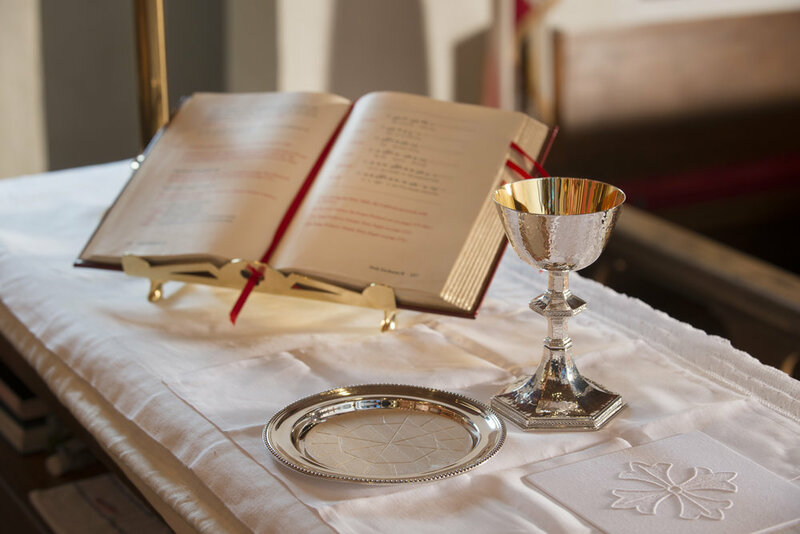 Lay Eucharistic Visitor– LEV’s take the sacrament from the Sunday morning service to parishioners who cannot attend due to temporary or prolonged illness or disability. Becoming a Lay Eucharistic Visitor requires a sense of call to this ministry and training. Lay Eucharistic Visitors are licensed by the Bishop at the request of the rector. Greeter – Welcomes worshipers as they enter the nave, assists visitors and newcomers, distributes bulletins, assists with seating, collects the offering, and assists parishioners with getting to and from the communion rail. Teams are scheduled through the parish office. Both adults and teenagers are welcome to volunteer. Acolytes–Serving as an acolyte is an ancient responsibility dating back to the earliest days of the church. Youth who are in 6th – 12th grade are eligible to serve. Acolytes assist by lighting the altar candles, carrying the processional crosses, torches, banners and flags, and assisting the priest throughout the service. On a typical Sunday at Calvary, seven acolytes serve at the 10:30 service. Adults are also needed for special services, such as during the week. Altar Guild– Guild Members prepare the church and chapel for services held in the church, including regularly scheduled worship, as well as weddings and funerals. They maintain all the altar metal-ware, linens, candles, and flowers. Two or three people work together as a team. Although Guild members traditionally were women, male Altar Guild members are more than welcome. Healing Ministry– The Ministry of Healing is offered at both services on Sunday, at the Taizé service, on Wednesday mornings, and on most Saturdays at the Food Pantry. If you are interested in learning more about this ministry, contact the church office at 828.684.6266.